Member involvement and militance paid off for UE Local 1135 in their new contract with Tulip Corporation, which includes the best wage package they have ever won. 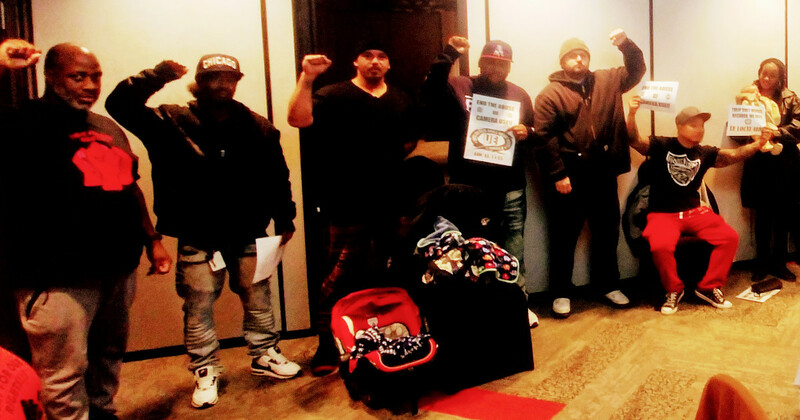 As their contract was set to expire on November 30th, after a 19-day extension, Local 1135 members joined their negotiating committee for the opening of negotiations, carrying signs and wearing t-shirts. A strong turnout showed the company that there was solid support for the union’s negotiating position in the shop. The company’s negotiating committee stormed off and refused to negotiate while members were in the room, so the union committee used it as an opportunity to talk with the members. When management came back into the room they started to move on a lot of language issues, but at the end of the day, their wage proposal was favoring people at the top of the pay scale, and they hadn't moved from their initial proposal on healthcare. Local 1135 chose not to sign another contract extension, which shocked the company. This was the first time Local 1135 had let a contract expire, and it made the company nervous. Managers started getting bussed in together, and extra security cameras were installed. The negotiating committee met members at the gate going in and out from work and produced a flyer after each round of negotiations to keep members informed and ready to take action. The union gathered cell phone numbers from members and sent “practice texts,” so members would be prepared to respond quickly if the committee called for a walkout. In addition to wages and health insurance, UE members forcefully fought off a management proposal to remove dues checkoff from the contract. Members also raised the issue that all last winter the furnaces had not worked in the plant. During negotiations this year, management got the furnaces fixed and up and running. The union set a strike date in January, but management saw the writing on the wall and sat down and provided a more equitable wage package the day before. The new four-year contract was ratified on January 11. Wages will be bumped for all job classifications, with back pay through November 11, with pay for those at the bottom of the pay scale, which includes nearly half the membership, rising from $12.70 to $13.20 in the first year of the contract. After the bumps, the top rates will increase 2.7%, 2.5%, 2.5% and 2.7% in the four years of the contract. New language on the placement of cameras in the shop mandates that they will not be used to capture data for the establishment of a piece-work system, will not be aimed to show people going to or from the cafeterias or restrooms, and will not be put into the lunch room(s) unless the union agrees. It maintains the union's right to negotiate over the placement of any additional cameras, including the placement of cameras and direction of lenses, and provides protection for union members when camera images are used in discipline for smoking, sleeping or unscheduled breaks. The company’s contribution to healthcare will increase $5/month for each year of the contract. The union also won company provision of cold-weather jackets and pro-rated holiday pay for part-time non-probationary employees. The negotiating committee consisted of President Malik Grant, Chief Steward Shantel Reed, Alicia Black, James Grant and Russ Parker. They were assisted by retired Local 1135 President Shirley Harrison and Field Organizer Jason Whisler.